Have You Read the Best Harry Potter Book? Until a few days ago, I thought the best Harry Potter book was #6 (The Half-Blood Prince). Now imagine how my world has been turned upside down by discovering that not only have I not read the best Harry Potter book, but it’s not even written by JK Rowling. More on that sacrilege statement in a moment. 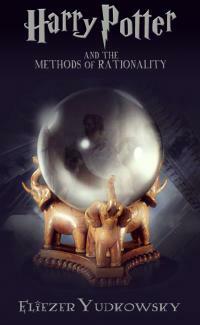 When I was at my family reunion in June, my brother mentioned a book called Harry Potter and the Methods of Rationality. I almost tuned out when he began, “It’s fan fic, but…” Nothing against fan fic, but I like the official stance of the author. I want the real version when I’m reading fiction. Andrew added that the author has Harry explore exactly what makes magic work in the wizarding world. Is it connected to the language of the spells? The gesture of the wand? The position of your body? With that, I was hooked. I love learning about well-developed magical systems, and it sounded like the author–fan fic or not–was going to delve deeper into the why and how of magic than Rowling did. Sweet! It’s wonderful to return to Hogwarts. I’ve already spent dozens and dozens of hours there over the years, so it feels a little bit like home. It’s an alternate universe, so it doesn’t contradict Rowling. I don’t want to say too much, but I’ll give an early example: Harry’s adoptive parents are actually quite lovely. As an adopted child myself, this is wonderful to read. Why are there so many terrible adoptive parents in books? I like this much better. Harry questions everything…and finds answers through experimentation and skill, not luck. This is the whole magic system my brother talked about. Harry does a lot of experiments with magic to figure out how it works and just how far it’ll go, and it’s fascinating. Harry decides to be the hero of his own story. The Harry Potter we know and love is a solid protagonist, but quite often, the story happens to him instead of Harry actively pursuing a course of action. This alternate version of Harry Potter is an extremely active protagonist. Is it perfect? No. This new Harry can be quite annoying at times, and the author often gives him too much space for lengthy diatribes. I skim through many of them. Also, as good as it is, it wouldn’t exist without the real Harry Potter books. This book could not stand on its own, as it relies on the original series to compare pretty much everything against. But that’s also what makes it work. There are so many times in Methods of Rationality where you’ll say, “Yeah, why didn’t that happen in the original books? Any other way makes no sense!” Just wait until you get to the Snape chapter. You’ll know what I mean. Have you read this book? If so, what do you think? Have you ever read fan fic that equaled or bettered its predecessor? This entry was posted on Monday, August 1st, 2016 at 9:27 pm	and is filed under books and tagged with books. You can follow any responses to this entry through the RSS 2.0 feed. I have added this to my reading list. I also like that it keeps the original universe as true as possible, and like the science take. It’s an interesting take on HP and was started before Deathly Hallows was written. It’s a take that it took Harry Potter 13 years to defeat Voldemort, and everyone he loved died. Afterward he found a way to go back in time and alter the past. Things do not turn out as expected, and the effort to change things cause as many problems as they solve. Unfortunately it is not finished, but it is still one of the more interesting takes on Harry Potter that I’ve seen. Like what you mentioned the basic plots, the tenants of the story stay the same, but with some twists, as Harry knows what we know, and remembers just as much about the story that someone who read it a few years ago. He’s also imperfect. It was also done won FanFiction.net like your story, but the 2nd link is to an epub which with some work can be put on the kindle. That sounds awesome, Sean! I love the idea. Do you think the author will finish it? He’s on chapter 42, which is in year 4 with the goblet of fire. Unfortunately due to his work and some health issues, it is unknown whether the story will be finished. However I’ve found it such an enjoyable story that I’ve read what there is three times in the last 3 years. On the Rationality fiction I’ve read through to the portion of describing Nasa. I’m hooked! I want to thank you again to alerting me to this book!